Can you return the packaging to us for reuse or recycling? Recycling is a fundamental concept for us! We try to get the most use out of all of our packaging. Some items such as plastic berry pints and paper egg cartons that come into direct contact with food we cannot reuse due to Health Department Regulations. We can reuse the corrugated boxes and we promote our Members to return them each week so we can pick them up and fill them again with more Good Food! For this reason we carefully source our plastic items and use post-consumer recycled content and #2 recyclable whenever possible. We try to put everything that needs to be packed in plastic for dehydration concerns inside one big poly bag. This can be re-used in your household as trash can liners, recycling collection, etc. Our group of egg produces buy cartons collectively in bulk to cut costs and only purchase 100% post-consumer recycled cartons. They are also manufactured in Florida by the ONLY domestic egg carton company. They make a great addition to your home compost pile or home recycling. Last but not least, we try to make it fun for folks to return our boxes! We encourage “box graffiti” and post our favorite artistic boxes in the Weekly Newsletters. 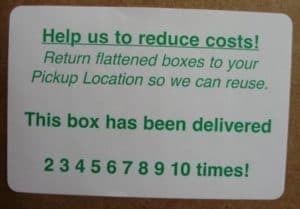 If you get a box that you are returning to us to be re-used for the 10th time (we circle the label each time it is re-packed and delivered) you will get a bonus in your next box!